A tale about humans between the North and the South, about globalization, and about fish. 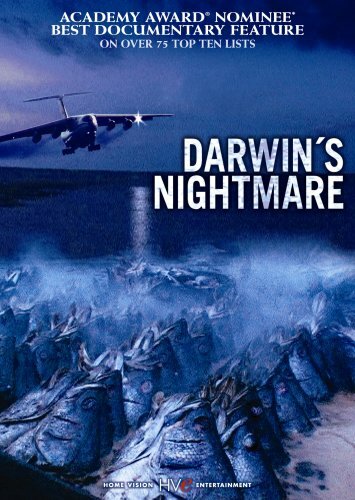 There is good reason for DARWIN'S NIGHTMARE to be given the Oscar for Best Documentary: scores of critics have written that this is the best film they have seen in ten years, and it has won over twenty international awards. Some time in the 1960s, in the heart of Africa, a new animal was introduced into Lake Victoria as a little scientific experiment. The Nile Perch, a voracious predator, extinguished almost the entire stock of the native fish species. However, this new gigantic fish multiplied incredibly fast, and its white fillets are today exported all around the world. Huge hulking ex-Soviet cargo planes come daily to collect the latest catch in exchange for their southbound cargo: Kalashnikovs and ammunitions for the uncounted wars in the dark center of the African continent. This booming multinational industry of fish and weapons has created an ungodly globalized alliance on the shores of the world’s biggest tropical lake: an army of local fishermen, World Bank agents, homeless children, African ministers, EU-commissioners, Tanzanian prostitutes and Russian pilots. DARWIN'S NIGHTMARE brings us in close for an intimate and at times uncomfortable look at this world, and in doing so this film deftly unpacks the puzzle of globalization in a visually stunning and raw portrait of life on this planet.